Homer: Well, okay, let's go. Who's Tiny Tim? The Simpsons has been on long enough that kids who weren't even born when it started are old enough to have their learner's driving permits. Think about that: There are honest-to-goodness teenagers who cannot remember a time before Bart, Homer, Lisa, Marge, and Maggie. I think it's safe to say that the show has, and will, endure along with classics like I Love Lucy and Star Trek. Prolonging its shelf life, of course, is the ridiculously slow pace of the DVDs releases from Fox. Season One came out in 2001, and we're only up to Season Three (to put that in perspective, some 14 combined seasons of various Star Trek series have been released in the same timeframe. To make up for the fact that I'll be close to 40 by the time the entire series is out on DVD, Fox is releasing a series of "best of" themed compilations to tide fans over. Treehouse of Horror offered a collection of Halloween episodes, and this, the newly released Christmas with the Simpsons, is along the same lines. It offers those of you who like the later seasons to see them on DVD while your brain is still functioning. Five episodes are included, spanning 13 seasons. All appear to be identical to the uncut original airings. This episode, also available on the Season One set, is very fondly remembered, most likely because it was the first time most people met the Simpsons. A Christmas special that received heavy promotion during the series' inaugural season, its success was a harbinger of the enormous popularity to come. In hindsight, it's still not a bad episode, and it's actually one of the best from the uneven first season. When Marge spends all the Christmas present money paying for laser tattoo removal for Bart, Homer is forced to get a second job as a mall Santa to pay the bills. Features the first appearance of Santa's Little Helper. I've reviewed this one before, but this time I'm feeling, oh, 3.5 donuts (out of five). 4.5 donuts for Mr. Plow. That's his name. That name again is Mr. Plow. 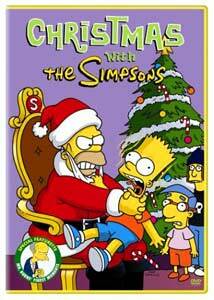 This strong holiday outing represented the third dedicated Christmas episode following Marge Be Not Proud, which is not included on this disc. And it's a good one�Bart sneaks downstairs to open his presents early and inadvertently starts a fire that burns down the tree and toasts all the presents. To cover, he says he saw a burglar stealing Christmas. The story makes the news, and Springfield, in a generous mood, takes up a donation for the family. The existence of Bart's conscience is again confirmed when he cracks under the stress and reveals his crime. A nice combo of humor, satire, and heartwarming holiday fuzzies. This most recent Christmas special is disconcerting to watch following the first three on this disc. It comes from Season 11, well past the point when the series had sacrificed character for absurdist humor. Unless you don't think evil toy marketers, sentient Furbys, and Gary Coleman qualify. Anyway, after the school nearly goes bankrupt, Principal Skinner signs a contract with corporate backers who use the kids to conduct market research. There are some good gags, but the story doesn't hang together very well. At least Coleman is great; "What'chu talkin' 'bout everbody? has replaced "God bless us, every one" in my house. Not really. Marge: This is the worst thing you've ever done! Homer: You know, you say that so much it's lost all meaning. After Bart and Homer set the church on fire with a model rocket (in the typical first act non sequitir), Reverend Lovejoy brings in corporate sponsors to help foot the bill. Lisa is disturbed by the blasphemy of the sponsors turning the pews into lush armchairs and endorsing prayers ("Money changed! Get your money changed here! "), and her crisis of faith leads her to convert to Buddhism (with the help of special guest star Richard Gere), but her family tries to lure her back into the fold with the promise of Christmas presents. A nice parody on commercialism. All in all, you could do a lot worse than this collection of five Simpsons favorites, especially since it might be a decade or more before we see a few of them on a proper DVD season set. But Fox, if you're going to go through all the trouble of putting together a Christmas collection, why include a tangential show and cut Marge Be Not Proud, the one where Bart shoplifts on Christmas and must earn back Marge's trust? Talk about being a Grinch! Image Transfer Review: Video quality varies with the age of the episode. The older ones�Simpsons Roasting on an Open Fire and Mr. Plow—look a little rough, washed out, and grainy. But the newer ones are great, with crisp lines and colors, and not a hint of grain (especially the two from the "teen" seasons). Basically, quality on the older episodes is comparable to the season sets, and the new episodes look much, much better. Audio Transfer Review: Audio is fine too. These DD 2.0 tracks confine everything to the front soundstage, but sound bright and zippy regardless. Speech is clear and the music is spread nicely across the front mains. The newer episodes even show off with instances of directionality and stereo separation. Extras Review: I suppose the Mr. Burns' Finest Moments montage counts as a feature, but I wouldn't exactly say it's special. The three-minute clip splices together some of Mr. Burns best lines and gags from many different seasons. I guess it's nice for people who don't have time to watch an entire episode. I guess. Fans of season sets might not like buying "best of" discs, but they don't have much of a choice if they want to see the later episodes of The Simpsons on DVD before time as we know it ceases to exist.